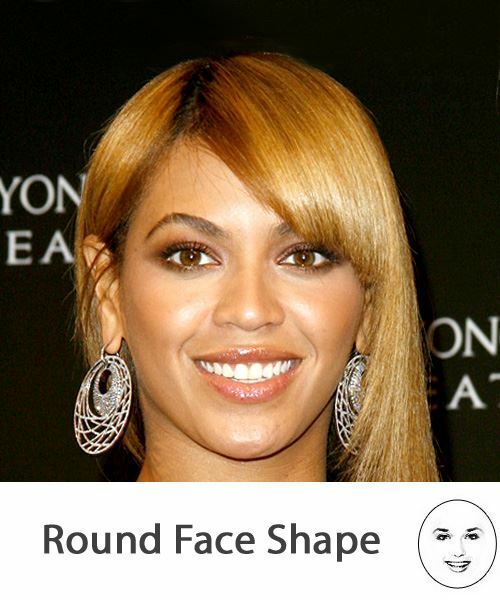 If you have a round face shape, the object is to add length and avoid width. If bangs are used they should be swept across, or in the case of solid bangs, only where there is substantial height on the top. Side parts and heavy straight across bangs create a wider shorter shape and therefore should be avoided at all costs on hairstyles without any height. This hairstyle adds height and makes a round face appear longer than it actually is. People with round faces need to add height not width, which is exactly what this hairstyle does. This hairstyle makes a face appear even rounder and wider. The bangs make the face shorter while the sides that kick out once again promote width. This is a good example of what not to wear. This hairstyle gives the appearance of an oval shape. The sides help slim the face down, while no bangs show off more forehead and therefore a longer shape. The off centre part helps divide the face evenly making it also appear longer rather than wider. It's a nice look! This soft layered look is fabulous for round face shapes. The middle part helps divide her face into two longer portions while the absence of bangs doesn't compromise any vertical length. Straight hair would actually be more suitable and slimmer in design but this example shows a good indication of how shape is everything in hairstyle design. This hairstyle shows how a round hairstyle and a round face really don't complement each other. Although having this much volume at the crown can sometimes be a good thing, this style adds width to the sides which makes the face appear larger and incredibly round. The bangs are a nice touch but cover the face up too much. It is a lovely hairstyle but it is just not suited to a round face shape. Height through the crown (to lengthen your face shape). 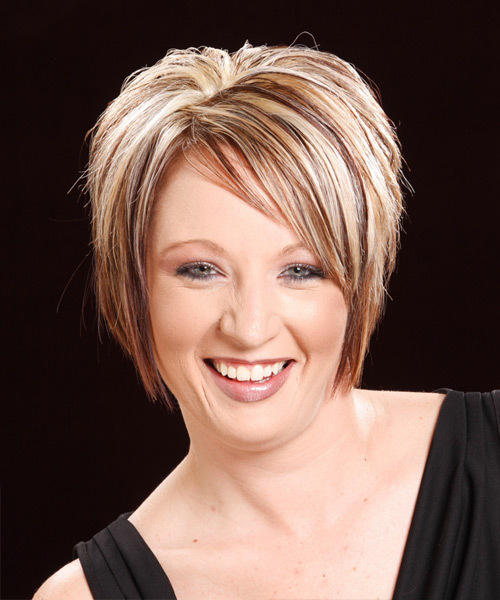 A short concave bob with side-swept bangs will add length to a round face shape. A medium length bob is also suitable for a round face shape, and when teamed with a middle or center part, will create a very flattering shape for your face. Waves or curls that create a wide, round shape around your face. Straight across blunt cut bangs that cut your face shape in half. Chin length bobs that are straight or kicking out which will only accentuate a round face. Blunt cut bobs that end at the chin as they will exaggerate the roundness of your face. 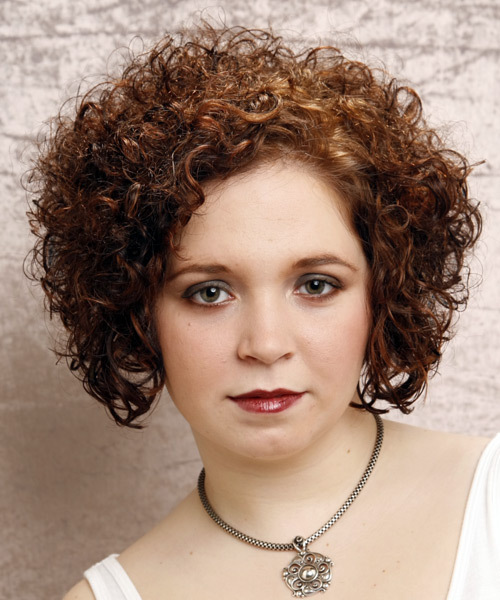 A curly bob that is round in shape will only create an even rounder look when teamed with your face shape and should be avoided. Avoid a blunt cut chin length bob with straight across bangs that cover your forehead. The bangs will make your round face look even shorter and the blunt length stopping at chin length will only highlight the roundness of your face shape. To make the most of a round face shape, your bangs should add some much needed length and also narrow down the sides of your face to create a much more flattering face shape. Long bangs that can be shaped around the perimeter of your face will add length and create a narrow line around your face. Wispy, side-swept bangs will flatter and add softness to a round face shape without covering up too much of the shape and making the face look smaller. Round face shapes can look wide and short so bangs that are going to really accentuate those types of features, such as full, blunt cut bangs which will halve the length of your face, should be avoided. Short bangs that stop above your eyebrows will instantly shorten the length of your face. Bangs that have been blunt cut and styled straight across will shorten your round face shape. By choosing the types of bangs that will give your round face shape a much more flattering look you can then give focus to the other features of your face, such as your eyes, really nicely shaped lips or your nose, so be sure to keep these types of bangs in mind when looking for the right bangs for you. If you're after more options then visit our hairstyle categories for plenty of great bangs hairstyle ideas. 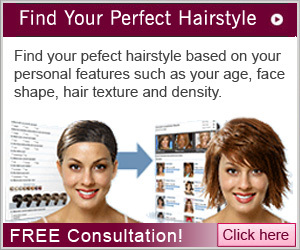 To see if the hairstyles featured in this article will suit you, click on the images to try the virtual hairstyle on your own photo or our model.